The Berlin Conference (German: Kongokonferenz or "Congo Conference") of 1884–85 regulated European colonization and trade in Africa during the New Imperialism period. 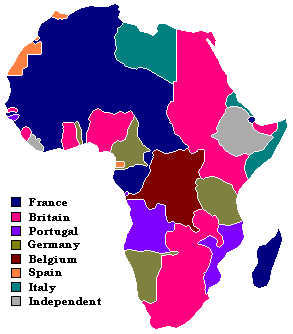 Called for by Otto von Bismarck, the first chancellor of Germany, its outcome, the General Act of the Berlin Conference, is often seen as the formalization of the “Scramble for Africa.” The European powers literally divided Africa up between themselves, often creating quite artificial states that lacked any cultural or linguistic or ethnic coherence. Most of the European powers, although they justified their acquisition of African colonies in terms of civilizing, ended up exploiting them. When de-colonization took place in the mid-to-late twentieth century—often reluctantly, following armed freedom struggles—the economies left behind were ill designed to cope with independence, being mono-crops designed for European markets, not products for local people. Implied in the initial division of Africa was the idea that Africa did not belong to anyone, and so could be claimed. No Africans sat at the table. African states were not regarded as legitimate, legal entities. Africa is still coping with the consequences of the European scramble. The notion of dividing up the world was not new; Pope Alexander VI's papal bull of 1493 divided the world between Spain and Portugal, giving these Christian nations permission to invade 'barbarous nations' and bring their people into the true faith. When the scramble to parcel out Africa began, 80 percent of Africa was free of European rule. At the end, only Ethiopia and Liberia were independent. In the 1880s, European interest in Africa increased dramatically. Henry Morton Stanley's discovery of the Congo River Basin (1874–1877) removed the last bit of terra incognita from the maps of the continent. In 1878 King Léopold II of Belgium, who had previously founded the Association Internationale Africaine (International African Society) in 1876, invited Stanley to join him. The International African Society had the goal of researching and "civilizing" the continent. In 1878 the International Congo Society was also formed, having more economic goals, but still closely related to the former society. Léopold secretly bought off the foreign investors in the Congo Society, which was turned to imperialism|imperialistic goals, with the African Society serving primarily as a philanthropic front. From 1879 to 1884 Stanley returned to the Congo, this time not as a reporter, but as an envoy from Léopold with the secret mission to organize a Congo state, which would become known as the Congo Free State. At the same time, the French marine officer Pierre Savorgnan de Brazza traveled into the western Congo basin and raised the French flag over the newly-founded Brazzaville in 1881, in modern Republic of Congo. Portugal, which also claimed the area due to old treaties with the native Kongo Empire, made a treaty with Great Britain on February 26, 1884 to block off the Congo Society's access to the Atlantic. At the same time, various European countries tried to get a foothold in Africa. France occupied Tunisia and today's Republic of the Congo in 1881—which partly convinced Italy to become part of the Triple Alliance—and Guinea in 1884. In 1882, Great Britain occupied the nominally Ottoman Egypt, which in turn ruled over the Sudan and parts of Somalia. In 1870 and 1882, Italy took possession of the first parts of Eritrea, while Germany declared Togo, Cameroon and Southwest Africa (now Namibia) to be under its protection in 1884. Léopold II was able to convince France and Germany that common trade in Africa was in the best interests of all three countries. On the initiative of Portugal, Otto von Bismarck called on representatives of the Austro-Hungarian Empire, Belgium, Denmark, France, Great Britain, Italy, the Netherlands, Portugal, Russia, Spain, Sweden–Norway (union until 1905) and the Ottoman Empire to take part in the Berlin Conference to work out policy. The Berlin Conference took place in 1884. The German leadership believed that Britain and the other colonial powers had an unfair economic advantage because they possessed overseas markets. The Free State of the Congo was confirmed as private property of the Congo Society. Thus the territory of today's Democratic Republic of the Congo, some two million square kilometers, was made essentially the property of Léopold II (because of the terror regime instated, it would finally become a Belgian colony). The 14 signatory powers would have free trade throughout the Congo basin as well as Lake Niassa and east of this in an area south of 5° N.
The Niger and Congo Rivers were made free for ship traffic. An international prohibition of the slave trade was signed. The principle was set down that powers could only possess colonies if they actually possessed them (Principle of Effectivity). Any fresh act of taking possession on any portion of the African coast would have to be notified by the power taking possession, or assuming a protectorate, to the other signatory powers. It is also noteworthy that the first reference in an international act to the obligations attaching to "spheres of influence" is contained in the Berlin Act. A line running from Say, in Niger to Baroua, on the north-east coast of Lake Chad determined what part belonged to whom. France would own territory to the north of this line, and Great Britain would own territory to the south of it. The Nile Basin would be British, with the French taking the basin of the River Chad. Furthermore, between the 11th and 15th degrees longitude, the border would pass between Ouaddai Kingdom, which would be French, and Darfour in Sudan, to be British. In reality, a no man's land 200 kilometers wide was put in place between the 21st and 23rd meridian. To the north of a line formed by the intersection of the 14th meridian and Miltou was designated French, to the south being Germany's. Italy was to own what lies north of a line from the intersection of the Tropic of Cancer and the 17th meridian to the intersection of the 15th parallel and 21st meridian. The Scramble for Africa sped up after the conference. Within a few years, Africa was at least nominally divided up south of the Sahara. By 1895 only the settlements in Liberia, Orange Free State and Transvaal remained independent. Abyssinia was able to fend off an Italian invasion from Eritrea which lasted from 1889-1896 in what is known as the first Italo-Abyssinian War, remaining the only free native state, but this was an exception in the continent of Africa. By 1902, 90 percent of all the land that makes up Africa was under European control. The large part of the Sahara was French, while after the quelling of the Mahdi rebellion and the ending of the Fashoda crisis, the Sudan remained firmly under joint British–Egyptian ruler-ship. The Boer states were conquered by Great Britain in the Boer Wars from 1899 to 1902. Morocco was divided between the French and Spanish in 1911, and Libya was conquered by Italy in 1912. The official British annexation of Egypt in 1914 ended the colonial division of Africa. By this point, all of Africa, with the exceptions of Liberia and Ethiopia, was under European rule. History of "Berlin Conference of 1884-85"
This page was last modified on 29 August 2008, at 13:19.